Location: Corofin, County Clare, Ireland. Built: between 1470 and 1490. Condition: Intact. Known as the Clare Archaeology Centre. Notes: O'Dea Castle, also known as Dysert O'Dea Castle, is an Irish fortified tower house, loosely described as a castle at Dysert O'Dea, the former O'Dea clan stronghold, 5 km from Corofin, County Clare just off the R476 road. It was built between 1470 and 1490 by Diarmaid O'Dea, Lord of Cineal Fearmaic, and stands some 50 feet high on a limestone outcrop base measuring 20 feet by 40 feet. The tower is located right next to Dysert O'Dea Monastery. Today, the centre is known as the Clare Archaeology Centre, with exhibits of local archaeological artefacts from 1000 BC to 1700 AD, local history over the last three centuries, and a wall walk of parts of the castle. 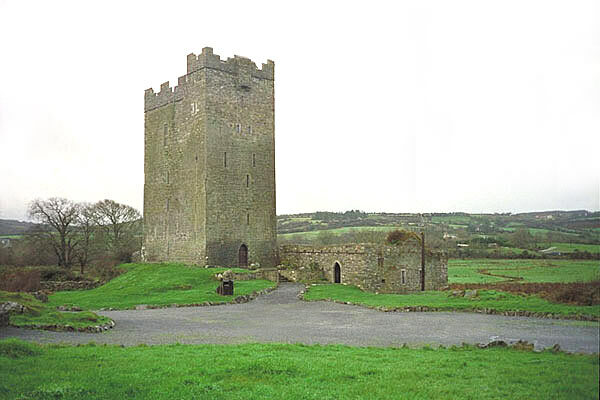 The Dysert O'Dea Archeology Trail includes sites around the tower, including the remains of the Dysert O'Dea Monastery.